The Story Flips: Burger King Says It Isn't Moving Into Crimea : The Two-Way A Russian franchisee had said the fast-food empire was looking to extend its rule into the disputed territory. Now, the company says stories about those comments were overdone. We updated this post with a major development at 1:15 p.m. ET. A Burger King restaurant in Moscow. The company's Russian arm says it will extend its reach into Crimea. 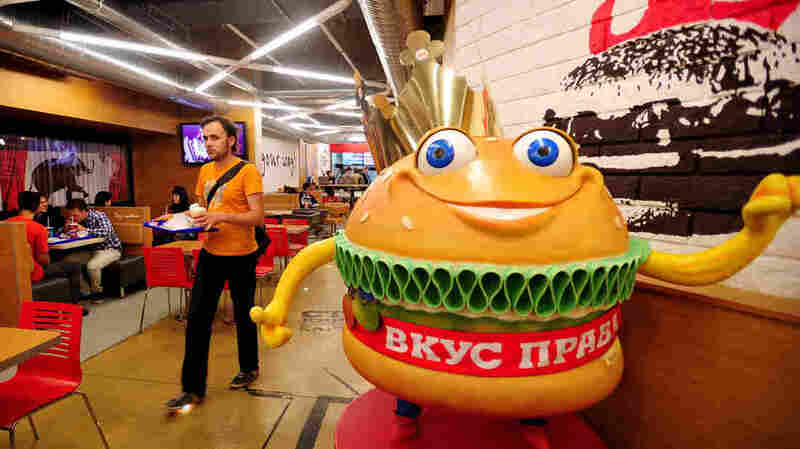 Reports that Burger King is looking to open restaurants in Crimea now that McDonald's has decided to pull out of that region were overcooked, a Burger King spokesman says. Responding to the stories that we saw across the news media and posted about earlier today, Burger King spokesperson Bryson Thornton emailed to say that "neither Burger King Worldwide, nor any of its franchisees, have plans to open Burger King restaurants in Crimea." When we inquired about whether the earlier reports had been incorrect, Thornton said that they had been based on "a non-committal, off-the-cuff statement made by our Russian franchisee that was reported as if it were a plan." One week after McDonald's announced it was temporarily closing its three restaurants in Crimea, Burger King Russia has said it plans to open shops on the disputed peninsula. Dmitry Medoviy, CEO of the Russian branch of the fast-food empire, tells ITAR-TASS that Burger King is "planning to introduce our services in Crimea, though I can neither tell you when exactly it will happen nor how many restaurants there will be." "Burger King operates about 200 restaurants in Russia. The brand has worked under franchise since 2010, when the first outlet opened in a Moscow shopping mall. In 2012, Russia's second-largest bank, state-owned VTB, paid $50 million for a 47 percent stake in Burger King Russia, the company that now operates the franchise. In 2013, VTB sold 12 percent of the company to a financial investor, reducing its stake to 36.6 percent, Forbes.ru reported." McDonald's cited the "evolving situation" in Crimea when it said it would shut off its fryers there. The chain has restaurants in the Crimean cities of Simferopol, Sevastopol and Yalta. That evolving situation, of course, includes Crimea's split from Ukraine last month. After the collapse of Ukraine's pro-Russia government in February (following months of protests in Kiev and other cities), Russian forces and pro-Russia militias moved to seize strategic locations on the Black Sea peninsula. Meanwhile, Crimeans voted in favor of joining the Russian Federation, and Russian President Vladimir Putin moved to annex the peninsula — over the objections of not only Ukraine's new leadership but also the U.S. and other Western nations. Now, there are fears that tens of thousands of Russian troops near Ukraine's eastern border may move into other parts of that nation. Click here to see much more of our coverage of the crisis in Ukraine.